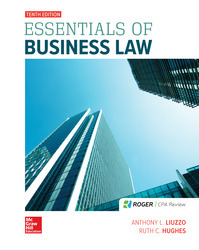 -Fundamental Overview of Business Law: This text is designed for business majors taking a one semester Business Law course. -A new chapter, Social Media Law, provides information, cases, and examples on important issues in social media as it relates to business. -Connect: An easy-to-use homework and learning management solution that embeds learning science and award-winning adaptive tools to improve student results.